Check out South African universities that have the most employable graduates - News around the clock!! The QS World University Ranking (QSWUR) has published its latest Graduate Employability Rankings, showing which universities in South Africa – and the world – produce the most effective and competent graduates. The rankings look specifically at which universities have the most employable graduates, by looking at how prospective companies work with the institutes, or hold the universities in high regard. The list also looks at successful people in today’s workforce, and the universities from which they came. “While many of the world’s top universities produce high-achieving graduates every year, employers frequently express concerns that academic institutions aren’t doing enough to prepare their students for the world of work,” QS said. For the 2018/19 rankings, the Massachusetts Institute of Technology (MIT) climbed four places to be the top-ranked university for employability, in addition to having been ranked as the best university in the world earlier this year in the QS World University Rankings. However this is not always the case, the group said. “Half of the top ten universities ranked don’t feature in the top 10 of the QSWUR. 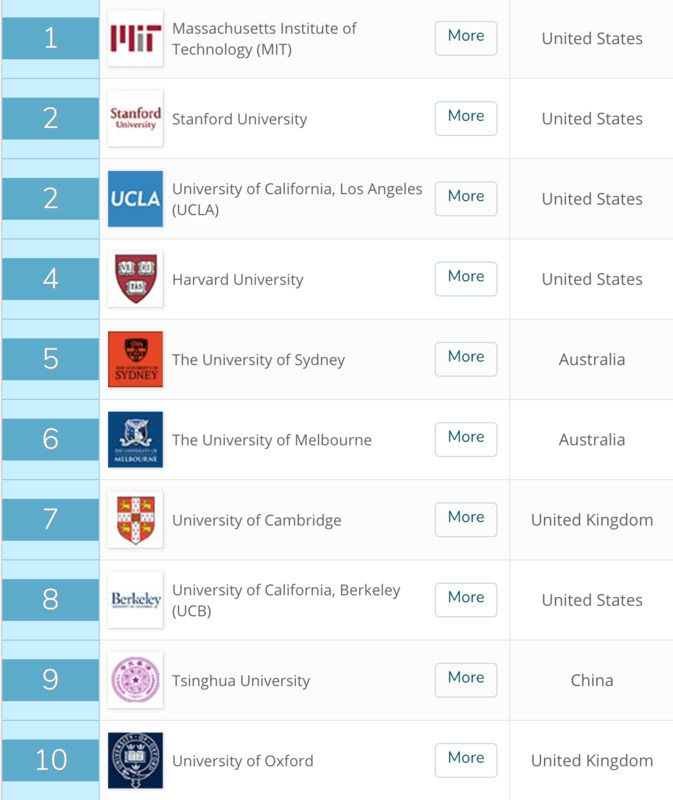 Most notably, the University of Sydney is ranked fifth for employability, but only 42nd in the world rankings. Sydney is part of a wider trend which sees Australian universities perform particularly well for graduate employability,” it said. Six South African universities were ranked in the latest listing, but none managed to crack the top 100. The University of Cape Town was the only local institute to land inside the top 200, ranked somewhere between 101st and 110th place, with the rest of the country’s universities placed outside the top 200. The University of the Witwatersrand ranked second in South Africa (201-250 overall), followed by Stellenbosch University, the University of Johannesburg, the University of KwaZulu Natal and the University of Pretoria – all ranked between 301st and 500th. The latest results show little change from the 2017/18 ranking, with the exception of the University of Pretoria, which dropped from being ranked third in the country to sixth. Each institution’s score is comprised of five carefully-chosen indicators. Employer Reputation excepted, all metrics used are, currently, unique to the QS Graduate Employability Rankings. Employer reputation (30%) – Employers identifying which universities have the most competent, innovative and effective graduates. Alumni outcomes (25%) – An analysis of which universities are producing “world-changing individuals”. Employer/Faculty partnership (25%) – University collaboration with employers, and work placement partnerships. Employer/Student connections (10%) – The number of employers who have been actively present on a university campus. Graduate employment rate (10%) – The proportion of graduates in full-time work 12 months after graduating. UCT was the only one with data on its graduate employment rate, showing that 97.2% of its graduates were employed within 12 months after graduating. However, data from all local universities was available on the Alumni Outcomes indicator. Here, Wits ranked top with a score of 91.5, followed by UCT (89.7), Stellenbosch (62.6), University of Pretoria (61.2), UKZN (57.5) and UJ (36.0).